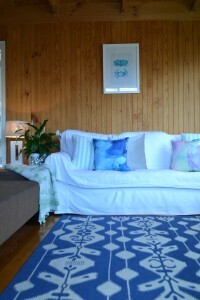 I’m very excited that Blooming Rooms has again been featured on Zingness, this time discussing beach house decor. A coastal or beach house theme is easy to achieve and works well in both modern and more traditional homes. Keep colours light and take your inspiration from the beach and nature – sand, driftwood, and different shades of blue are a great starting point! And as the article points out – use lots of white to keep the rooms feeling relaxed and restful, and add a splash of colour where needed. Enjoy the Christmas summer break! With the Spring Carnival behind us and Christmas a little over six weeks away, it’s time to start thinking about sending cards, buying gifts and getting our homes ready to celebrate with family and friends! Personally I love this time of year in Melbourne – the weather is warm but not so hot, and everyone seems a bit more relaxed even if it is a busy time. Getting our house ready should be the easy part and there are so many simple and stylish ways to inject a little Christmas spirit into your home. This months inspirational mood board is therefore all about Christmas with a collection of accessories and homewares designed to start getting you in the Christmas frame of mind! You can purchase this months mood board and the list of suppliers for only $19 taking away all the hassle of searching for the items yourself! Need a little more inspiration or have a Christmas style in mind? – feel free to drop me a line or complete an enquiry form and I would me more than happy to assist. It’s nice to inject some new life into your bathroom and it doesn’t need to be expensive! If you are renovating a bathroom, stick to neutral colours when selecting tiles and permanent fixtures or fittings. 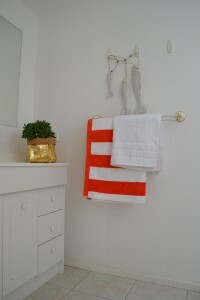 That way you can change the look of your bathroom quickly and simply by adding new towels and accessories. In this bathroom we have used white on the walls (both a large white tile and a hexagon feature tile) and grey for the floor tiles to create a blank canvas. Then by simply adding some colourful towels, and using bright objects or accessories to tie the colour scheme together – the bathroom comes alive. This bathroom features towels from Country Road and Ziporah and some bright ceramic pieces from Kmart. Welcome to Blooming Rooms! Here you will see my love for interiors come to life. Interiors that flourish! 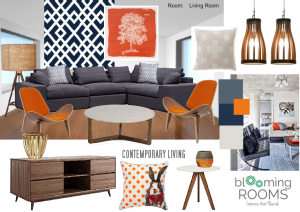 Beautiful spaces to live in should be stylish, practical and affordable for everyone and at Blooming Rooms we offer simple and practical design solutions for every room in your home. And all direct to your in-box. Check out some more examples of our Digital Mood Boards here. I’m very excited to finally have my online business up and running and I couldn’t have done it without my wonderful friend Prue. Thank you! I would love you to stop by and visit my website at www.bloomingrooms.com.au and let me know what you think! And please feel free to share this post with your friends and family!